Hannah - I chose to talk about caterpillars because I think everybody here will have heard the story of the very hungry caterpillar. So, I'm here to tell you that not only do caterpillars turn into beautiful butterflies, but they can eat more than Homer Simpson, they're stronger than the incredible hulk, and they're stronger than Nick's moles. They've got vision better than superman and they've got self-defences that Captain America would be really jealous of. So first of all, supervision like superman. So, we all know superman can see through walls. Well, caterpillars have got 12 eyes and they can see in a whole other dimension to us. They can see in the ultraviolet. This helps them find plants and helps them find the seeds that they start to eat. Then there are caterpillars that hide from their predators. They pretend to be something they're not and the black swallow tail caterpillar resembles bird poo. Now, if I was a bird, I don't think I'd want to eat my own bird poo, so this is a really good defence that I think any superhero would be really, really proud of. Caterpillars eat - can you believe this - more than Homer Simpson. They eat 27,000 times their own body weight in leaves in the 4 weeks that they're caterpillars. Now, that's the same as Nick, eating 68 cows.... a day! Now, the strength - caterpillars have more muscles than the incredible Hulk. We've got 600 muscles in our bodies and caterpillars have got 4,000! They can keep hold of branches, and when little birds find them on trees, they'd cling on really tight so that the birds can't predate them. And the peppered moss caterpillar looks like an oak branch or a birch branch that they rest on. And so, when little birds are hopping around the trees like they are at the moment, they just don't see them. They just think, "Well, that's a branch. I'm not going to bother eating that." And the caterpillars survive by these wonderful visual defences. Now, some of them have more than one defence and the puss moth caterpillar has quite an arsenal of defences. When it gets disturbed and it thinks it's really in danger, it puffs up its head and it reveals this bright red face with black fake eyespots. If that wasn't enough, it has this tail on its end that it whips at the predator right over its head. On the top of this tail, they have little red barbs that when they whip them at the predators, they really, really are very smelly. And if that wasn't enough.. then they squirt acid at them. Now, some caterpillars have evolved conspicuous and bright colour patterns and this is because they're very, very poisonous. Some caterpillars are hairy. They look like somebody has shaved their moustache off and I don't think anybody would want to eat something that's hairy. I think it will be quite tickly in your throat. Now, the snake mimic caterpillar I think is the best of all. So, when it thinks there's danger, it puffs up its head into this diamond shape and on the underside, it has fake eyes like a snake. When you get really, really close to it, it even wobbles its body to make you think that it's going to pounce and give you a venomous bite. So, caterpillars are strong, they eat absolutely loads, they have really cool vision, they can see in a whole other dimension to us and they also are the masters of disguise. They can pretend to be things that they are absolutely not. Ginny - There's another way of doing it where you can pretend to be really poisonous rather than actually being poisonous because of course, creating the poison costs something whereas if you can just look a bit like something poisonous, then you can get away with it. The same way that we might stay away from a hover fly that we see rather than swatting at it because we think it's a wasp. So, are there caterpillars that do that? Hannah - There are lots of caterpillars that really play a game of bluff. Ginny - Now, you've brought along a demo tonight to actually show a little bit about how this can work. Hannah - I like more than one volunteer. I'd like people who think they'd be really good little birds. Ginny - And your name? Ginny - Okay, so revels are a type of chocolate where they're all sort of similar sizes. Some of them look a bit more round than others, some are a bit more elongated. And some of them are a bit bigger, some of them are a bit smaller. When you dig in there, you might get a Malteser, you might get a chocolate covered raisin, you might get chocolate covered orange ball, or you might get chocolate covered coffee ball. Which one of those do you think sounds good? Payo - The Malteser one. Ginny - Which one sounds bad? Adam - I would say probably, the coffee one. Ginny - Okay, so we want Maltesers. We don't want coffee. But you don't know which is which so you're just going to have to guess. Hannah - Take a couple of them. Ginny - What was that one? Payo - I think it's coffee. Ginny - Oh no, bad luck! Hannah - The poisonous caterpillar, no! Adam - Orange. It's quite nice actually. Ginny - Okay, so orange is a good tasting caterpillar. So, what you might want to do is start paying attention to what they look like because then when you go back for more, you'll be able to get one that you like. What else have you had? Adam - I also had the raisin and the orange. And the raisin one is now the best. Ginny - So, I can see that you are going repeatedly for the small sort of nobly ones which we know are raisins and actually look very different from the others. So because you like those, you're going for those again. 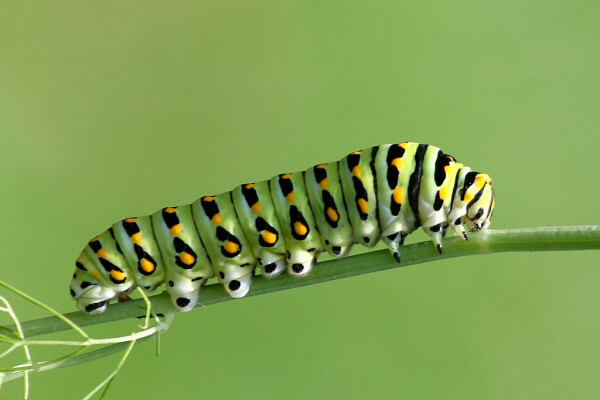 What exactly does that tell us about caterpillars? Hannah - Well, it tells us that if you are a caterpillar who's faking it and doesn't have any chemical defences or toxins that it actually pays a lot very different to something that is very palatable or it pays you to actually start to look like something that's really, really disgusting. It would be really, really good for us if our predators decided that a particular shape or a particular colour really wasn't ever worth attacking. Ginny - So, if you'd had some white chocolate ones in there and no one liked white chocolate, they'd be very easy to spot. So, if you wanted to pretend to be white chocolate, that would work really well. Hannah - Yeah and that's exactly what we see in nature. It's called mimicry. Ginny - Thank you so much, Hannah Rowland. Judges, what did you think about that? Max - I was just going to say, it's pretty impressive that you managed to talk for all that time about caterpillars without ever mentioning butterflies. It's very well-done. Georgia - And I'm looking forward to the new Marvel film, Captain Caterpillar. Ginny - Our judges are ready with their scores. So, over to you guys. Georgia - I'm going to give them a 9. Max - I'm also going to go 9. Ginny - Strong stuff there. A round of applause for Hannah Rowland.